Research within the School of Pharmacy shows the same entrepreneurial spirit that made Chitkara University what it is today. The School maintains a long tradition of interdisciplinary collaboration across academic departments, industry and government — conducting cutting-edge translational research that encompasses the full spectrum from basic laboratory discoveries to clinical care advances, and sparking real breakthroughs on complex and pervasive health challenges. Our CENTRE FOR RESEARCH IN PHARMACEUTICAL SCIENCES has filed a large number of patents. Semester VI students of Chitkara College of Pharmacy (CCP) presented their research work and relevant posters at MEDICON–2009—an international medical conference held at Mangalore, India. CCP’s elective research work was well-received and highly appreciated by the experts, doctors and scientists from the medical and pharmaceutical sciences from throughout the world. Karan Gupta, a Semester VI student of B. Pharm at CCP was conferred the prestigious “Best Paper Presentation Award” at the conference. The research work presented in the conference related to delineating the mechanistic aspects of synergistic interactions between various analgesic drugs. This research was suitably motivated and conducted under the guidance of Prof. Dr Sandeep Arora, Mr Ashish K. Rehni and Mr Thakur Gurjeet Singh. Other students who went for the presentations of their research work were (both students of Semester VI, B. Pharm). Students of Semester IV, Chitkara College of Pharmacy (CCP) presented their research work and relevant posters at “National Conference on “Drug Discovery, Development & Clinical Trials: Current Status and the Way Forward”, held on 27 June, 2010 at Shoolini University. The research work presented in the Conference related to the discovery of novel targets for drug dependence, and their effectiveness in treating stroke and delineating the mechanistic aspects of Epilepsy. CCP’s elective research work was well-received and highly appreciated by the experts and scientists from the medical and pharmaceutical sciences from throughout India. Joyti Thakur, a Semester IV student of B. Pharm was conferred the prestigious “Best Paper Presentation Award” for her work related to delineating the mechanistic aspects of novel targets involved in nicotine dependence. This research was suitably motivated and conducted under the guidance of Prof. Dr Sandeep Arora, Mr Thakur Gurjeet Singh and Mr Ashish K. Rehni. Other students who went for the presentations of their research work were Furjinder Dhiman, Manshu Narang, Radhika Sharma, Vivek Chabra and Jaspreet Singh (all students of Semester IV, B. Pharm). B. Pharm students of Semester VIII, Chitkara College of Pharmacy (CCP) presented their research work and relevant posters at the “Third Asian and Fourth National Medical Students’ Research Conference, Medicon–2010”—an international medical conference held at Coimbatore. CCP’s elective research work was well received and highly appreciated by the experts, doctors and scientists from the medical and pharmaceutical sciences from throughout the world. The research work presented in the conference was related to delineating the mechanistic aspects of synergistic interactions between various analgesic and epileptics drugs. This research was suitably motivated and conducted under the guidance of Prof. Dr Sandeep Arora, Mr Thakur Gurjeet Singh and Mr Ashish K. Rehni. Students who went for the presentations of their research work included: Mr Nikhal, Mr Pyush, Mr Vinum Puri and Mr Priyadarshi Gupta (all students of Semester VIII, B. Pharm). Students of B. Pharm (Semester VII) at Chitkara College of Pharmacy (CCP) presented their research work and relevant posters at the “International Conference of Pediatric Neurology and Epilepsy”, held from 29 October–01Novembe, 2009 at PGIMER, Chandigarh. CCP’s elective research work was well-received and highly appreciated by the experts, doctors and scientists from throughout the world. 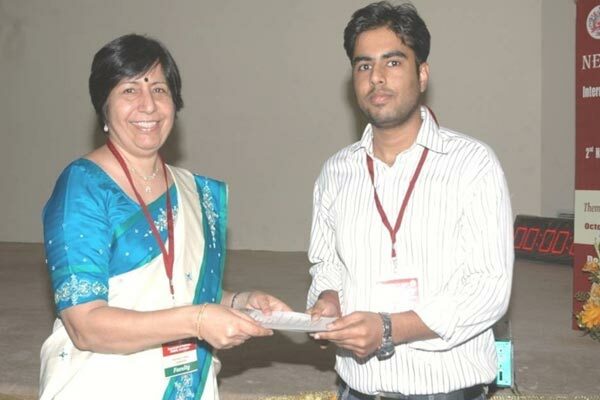 Mr Priyadarshi Gupta, a student of CCP, received the prestigious 2nd Best Paper Presentation Award from Prof. Pratibha Singhi, Professor and Chief, Pediatric Neurology and Neurodevelopment, PGIMER, Chandigarh. The research work presented in the conference related to the discovery of novel sources of stem cell and their effectiveness in treating stroke, and also delineating the mechanistic aspects of epilepsy. This research was suitably motivated and conducted under the guidance of Prof. Dr Sandeep Arora, Mr Ashish K. Rehni and Mr Thakur Gurjeet Singh. Other students who went for the presentations of their research work and were also highly appreciated for their ground- breaking research were: Ms Nidhi Behl, Mr Tarun Kakkar, Mr Ginish, Mr Vikram Singh and Mr Vinam Puri (all students of Semester VII, B. Pharm). A national conference was organized at MMU University, Mullana, Ambala where a host of dignified speakers, including Prof. Dr A. N. Kalia, and Prof. Dr S. Arora delivered lectures. Prof. Dr S. Arora delivered a lecture on increasing development of phytopharmaceutical from marine sources. Increasing number of antimicrobial and antiviral compounds are being developed from marine sources including mollusks, actinomyosis and other species. Apart from various phytopharmaceutical, a large number of sulphated long-chain carbohydrates derivatives, including fucans and lectins, are being explored for their utility as antiretroviral agents and for other therapeutic activities. The same were proposed as potential project area for research in phytopharmaceuticals field. Under the scientific leadership of Dr Sandeep Arora, Director, Chitkara College of Pharmacy, faculty and students presented their research work carried out at the institute in the “National Conference on Innovations in Drug Discovery and Research”. 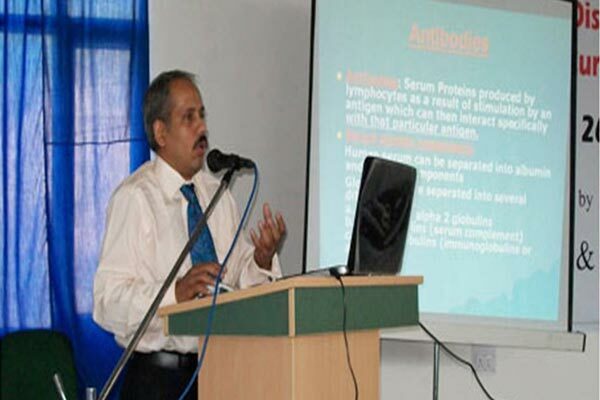 The Conference was from 3–5 March, 2009 at the Department of Pharmaceutical Sciences and Drug Research, Punjabi University, Patiala. The multifarious research presented by Chitkara College of Pharmacy (CCP) team was highly appreciated and well-received by the judges and other distinguished delegates, who came from various reputed research organizations and academic institutions from across the nation. Research work that was presented at the conference included work on synergistic interaction between various anti-inflammatory drugs and anti asthmatic drugs, and was presented by the following students: Karan, Vinam, Malvika, Harinderjeet Singh, Nidhi, Tarun, Shival, Priyadarshi and Gaurav. Mr Inderbir Singh, Mr Ashish Kumar Rehni and Mr Thakur Gurjeet Singh were the faculty members who presented their research work on novel drug delivery approaches such as dendrimers and ion exchange resins, and pharmacodynamics of ischemic postconditioning and pharmacological preconditioning of brain. The presentation by Mr Ashish Kumar Rehni, Lecturer, Chitkara College of pharmacy was adjudged the third-best in the poster presentation session at the conference.